Depicts the city during its 'silver age' - one of the most prosperous eras in its long history. Carthagena in de Spaansche West-Indiën. This is a c. 1766 Isaak Tirion map of Cartagena, Colombia. 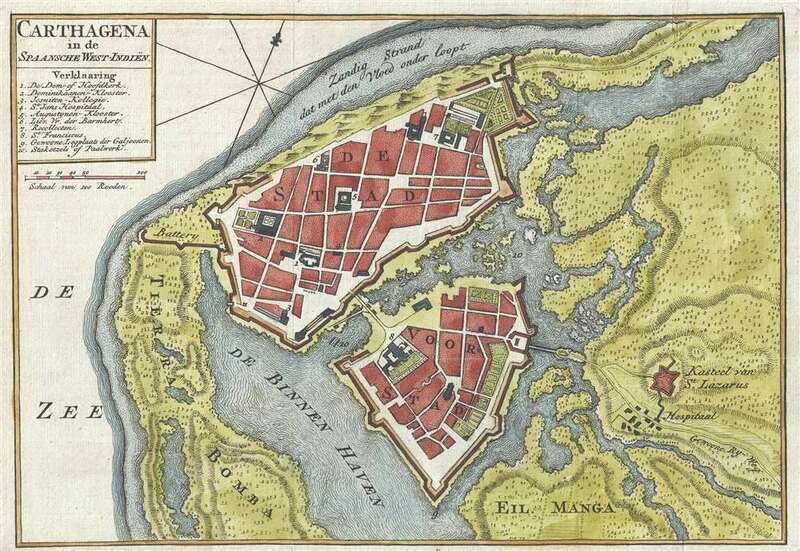 The map depicts the city of Cartagena, one of the most important port cities in the vast Spanish Empire. Several locations within the city are numerically identified, with the corresponding index located in the upper-left corner, just below the title. Monasteries, churches, gardens, hospitals, forts, and defensive batteries are among the illustrated locations. The St. Lazarus Castle, located outside the city, and its nearby hospital, are the only buildings identified which are not included in the numerical index. Cartagena sits on the northern coast of South America, on the Caribbean. This allowed the city to become the prime point of export of Peruvian silver mined from Potosí. Cartagena's status as one of the jewels of the Spanish Empire also painted it as a worthy target for raiders and pirates. Numerous attackers fell upon the city, and it was destroyed or held for ransom several times. Following each attack, the city's defenses would be improved, including the building of the walls and batteries evident on this map. This work by Isaak Tirion dates from the city's 'silver age', when it was the capital of the Viceroyalty of New Granada. This was a time of permanent expansion in Cartagena, with a massive influx of immigrants from the rest of the Viceroyalty and a massive increase in both economic and political power. The aristocracy descending on the city constructed estates, established libraries, and opened printing establishments. This prosperity lasted from 1750 until 1808, when the Mutiny of Aranjuez threw the entire Spanish Empire into crisis. This map was created by Isaak Tirion and published c. 1766.